Since the implementation of the Clean Water Act and subsequent creation of the United States Environmental Protection Agency (USEPA) in the early 1970s, commercial egg processing plants have been required to continually improve the quality of their process wastewater effluent discharges. The determination of wastewater quality set forth in environmental permits has been established since the 1970s in a series of laboratory analytical tests focused in four (4) major categories: organics, solids, nutrients and physical properties. For most egg industry professionals, a complete understanding of the standard methods required to accurately complete critical wastewater analytical tests is not necessary. 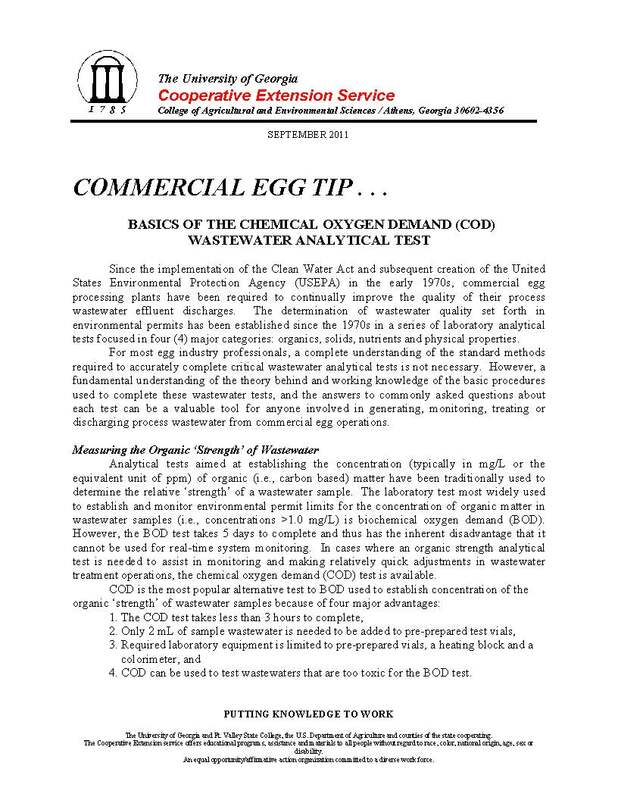 However, a fundamental understanding of the theory behind and working knowledge of the basic procedures used to complete these wastewater tests, and the answers to commonly asked questions about each test can be a valuable tool for anyone involved in generating, monitoring, treating or discharging process wastewater from commercial egg operations.